Ramblings about software, marine science and planning. The Caribbean island of Montserrat initiated a comprehensive marine spatial planning process in early 2016. Project partners include the Montserrat Government, the Waitt Institute and contractors, including the McClintock Lab (SeaSketch) and the Sustainable Fisheries Group at UCSB. These partners support the Blue Halo Steering Committee which is comprised of approximately 20 representatives from various stakeholder groups including recreational and commercial fishers, tourism, diving, conservation, science, and enforcement. Since May, 2017, Steering Committee members have been drafting proposals for a suite of ocean zones that would span the entire 0-3 nautical mile jurisdictional area around Montserrat. Prospective zones include partial-take and no-take marine protected areas (“sanctuaries”), mooring and anchorage zones, recreation zones, shipping areas, multi-use zones (i.e., status quo), and maritime volcanic exclusion zones. The Blue Halo Montserrat Steering Committee meets on April 10, 2017, to discuss ocean zoning options. Here, a stakeholder presents a zoning concept drafted in SeaSketch. One key design goal is to designate at least 10-30% of Montserrat’s near-shore environment within no-take MPAs to protect ocean habitats and replenish fisheries. Using SeaSketch, Steering Committee members used maps of benthic habitats, dive and fishing value, IUCN Listed Corals, and a conservation priority layer, to sketch and evaluate prospective zones. And, in March, 2018, the Steering Committee requested public comment on a comprehensive zoning plan that met the 10-30% protection goal for most habitats, falling slightly short for Colonized Volcanic Boulders, Coral Reefs, Seagrass and Hard Bottom Algal Reefs. A draft zoning proposal (Option 5) developed by the Steering Committee in March, 2018. On June 19, 2018, something quite interesting happened. The Steering Committee met to discuss comments that had been received from the general public regarding the latest zoning proposal. Some of the criticisms were articulated by a journalist for Discover Montserrat in an article entitled “Is the Marine Spatial Plan a Lose-Lose for Montserrat?” in which the author, Narissa Golden, expressed concern that the latest zoning proposal had only allocated 6% of the area in no-take marine protected areas. Simultaneously, on a Portuguese island over 2,600 miles away, masters students studying marine spatial planning (MSP) were using SeaSketch in attempt to help the Steering Committee address these criticisms. The Erasmus Mundus Masters Course on Marine Spatial Planning included lectures and a SeaSketch workshop where, rather than simply studying MSP, students were asked to actively participate by studying the Blue Halo Montserrat planning process, evaluating proposals developed by the Steering Committee and providing one or more options that would help improve zoning proposals based on objectives defined by the stakeholders in Montserrat. Masters students in the Azores, Portugal, work collaboratively in SeaSketch to refine a zoning proposal developed by the Blue Halo Montserrat Steering Committee. June, 2018. By studying maps depicting the distribution of valued fishing grounds and benthic habitats, the masters students developed a modified version of the Steering Committee’s Northern No-Take Zone shown above. Using a public forum in SeaSketch, students proposed their zone concept along with an explanation for how their design would double protections for coral habitat and increase Hard Bottom Algal Reef protections by another 12.5 square kilometers to meet planning guidelines. Furthermore, their plan would boost the amount of no-take marine protected areas to slightly over 10% of the study area. A zone proposal developed by a group of masters students which is a modified version of one developed by the Steering Committee. The Blue Halo Montserrat Steering Committee is currently deliberating this proposal alongside other ideas developed by the committee and members of the general public. It remains to be seen whether the student proposal is incorporated into the final zoning plan but, regardless, their work suggests several important ideas. First, sometimes good ideas can come from unexpected sources - including students from other countries, thousands of miles away. Second, the web-based decision support platform, SeaSketch, facilitated real-time participation in a transparent, science-based and stakeholder-driven process. 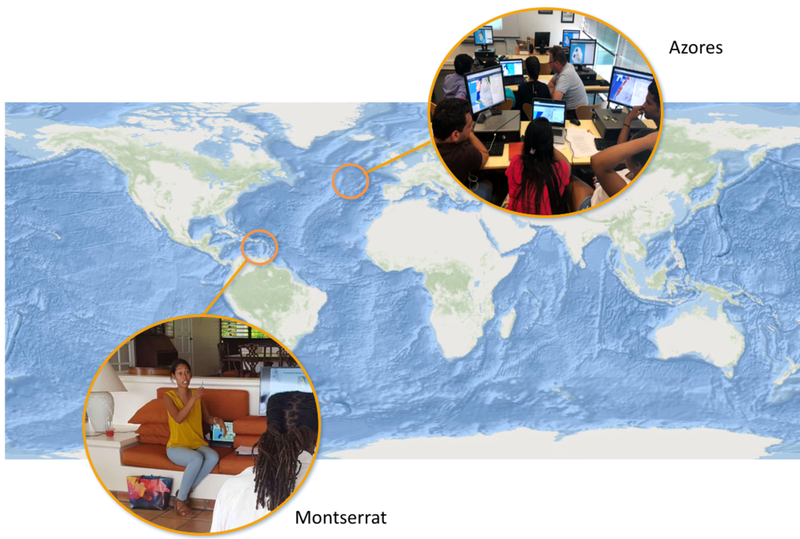 While the Erasmus Mundus students could not have traveled all the way from the Azores to Montserrat to participate in the MSP initiative in person, they could jump on the Internet and participate via SeaSketch. Good ideas can come from unexpected places. Students in the azores suggested modified zoning designs to stakeholders in montserrat. To view the latest zoning proposals or the experiment with sketching and evaluating zones in SeaSketch, visit http://montserrat.seasketch.org. To read more about the Blue Halo Montserrat initiative, visit their website. Dr. Will McClintock is a Project Scientist at the University of California Santa Barbara and former Director of the MarineMap Consortium. He received a B.A. in Biology from Earlham College, M.S. in Behavioral Ecology from the University of Cincinnati, an M.A. in Counseling Psychology from Pacifica Graduate Institute and a Ph.D. in Ecology, Evolution and Marine Biology from the University of California Santa Barbara. He has participated in over a dozen marine spatial planning initiatives around the world. The McClintock Lab is located at the University of California Santa Barbara, Marine Science Institute.